Big Things in Australia guide! When cheapest time to hire camper in Australia? If you are looking for a review of Travelwheels, then this is great place to start! 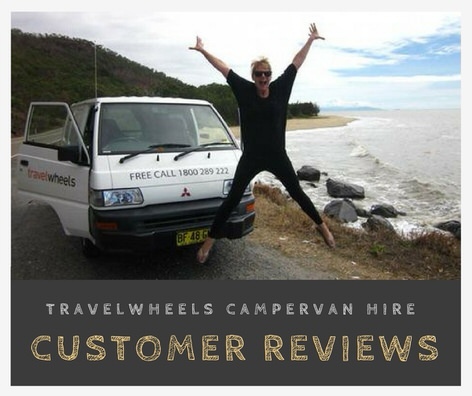 Right here we list loads of recent reviews from customers who have booked a campervan in Australia with us. Travelwheels specialised in good value for money budget campervan rentals in Australia. Our reviews reflect this and here are just some of the recent customer reviews about Travel wheels. You can contact us anytime to ask any questions about travelwheels or our campervans. We look forwards to hearing from you soon. Claire Amie and her friends review for a 3 Person camper for a long weekend trip from Sydney on facebook. For a list of more facebook reviews of travelwheels check out our fan page. Travelwheels review from our happy Italian customers! These guys hired a camper from Cairns to Sydney and said it was great fun! They said it was best way to see east coast of Australia and therefore gave travelwheels a positive review! You can go wherever your want as you have your camper and you have your bed! Therefore we stopped at so many places we would never have found! As a result of hiring a campervan we saw the real Australia! For example, at one point we ended up at this incredibly beautiful waterfall! We were driving along and saw the sign! Therefore we instantly made a detour and visited the waterfall, and in this case it was an magical experience! Customer review, “This is one of the great things about hiring a campervan with travelwheels! You can choose for example where you want to sleep, visit, cook, chill and explore this amazing country! Here is a link to their travel blog about Australia with more reviews and travel tips about Australia. Sam François gave us a great review after his first experience with hiring a campervan in Australia! The campervan was very clean! The staff were great and he had an amazing experience with our campervan! I would definitely recommend to hire a Van while you’re traveling in Australia this gives you the freedom of see most of the country (from the beach to deep in the land) at a very low price and with a maximum of comfort. Thumbs up even more for the friendliness of the rental agents for their amazing support and help at anytime of our travel from before to after our trip ! These two customers hired this automatic campervan from Sydney. They explored the coastal route between Sydney via Melbourne on the way to Adelaide. From here they headed back towards Sydney via the inland route instead of the coastline. They had a fantastic trip and we asked them a couple of questions about the van/trip. Question, Why would you choose a campervan holiday in Australia then say compared to a bus/coach holiday? The great thing about a campervan holiday is that it gives you total freedom to explore Australia! You can choose where you want to stop and for how long. You are not confined to a bus or coach timetable! You can get up when you want and explore what you want to see! Therefore you get to see and experience different things that the same tourist stuff everyone else does! Really recommend this small 2 person automatic campervan. Very easy to drive and feels more like a car than a camper! Very easy to park and it does not have any bold or bright colours plastered all over the campervan. This makes stopping in remote places easier, and saves on going to campsites on route. The guys are travelwheels were really good. They were very helpful and friendly and gave us great advice on where to camp for free. They told us places to stay, visit and what to see on our route. We went from Sydney via Melbourne down to Adelaide. Then we took the inland road back to Sydney and this was amazing. Really recommend these guys, and travelling by campervan is the way to go! Here is the list of the top five camper van holidays our customers reviewed, and which ones they loved the most! Sydney to Cairns – this is the most reviewed and popular campervan holiday in Australia. 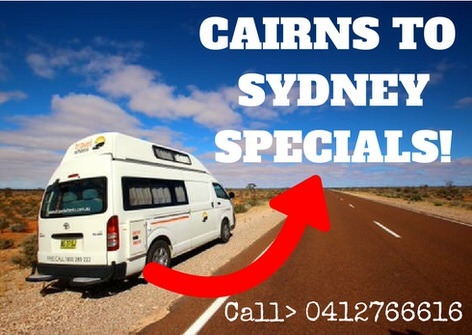 Cairns to Sydney road trip – customer reviews stated they found this route cheaper than Sydney to Cairns. Melbourne to Sydney road trip – we get loads of good customer reviews about this fantastic road trip! Sydney to Sydney camper hire. Good reviews for people wanting to try out at short trip before committing to a longer campervan holiday. For example short trips reviewed from Sydney include the Blue Mountains, Port Stephens and especially Jervis Bay to visit the dolphins. Great Ocean Road – A firm favorite and plenty of good reviews about this trip. You have read the reviews, now check out our prices online! Now that you have read some of the customer reviews, now check out prices! For example our online price checker will give you our lowest rates on camper hire in Australia. Unser deutschsprachiges Team hilft euch kostenfrei den Australienurlaub zu plannen. Schickt uns eine Nachricht und unser deutschsprachiges Team wird euch antworten. L'équipe Française de Travelwheels peut vous aider à planifier votre voyage gratuitement. Envoyez nous un message et notre équipe super sympa vous répondra en Français! Urgent, contactez moi par téléphone.